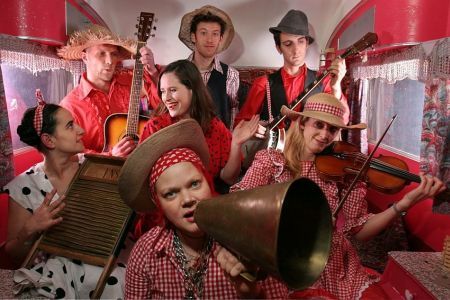 Cut A Shine are a London based troupe of traditional musicians, dynamic dancers and crazy callers determined to spread the word that the Hoe Down is a?happening. From Hoxton to Humberside, from Amnesty International to Bestival, Cut A Shine are putting ceilidh back on the map ? whether at sell out dances in London or the top summer festivals. This ?Anarchic Hillbilly Barn Dancing Squad? will bring a rip-roaring, thigh-slapping, pavement-stomping, exhilarating, heart thumping, blood pumping barn dance creation to any event. Whilst the banjo and the fiddle set the tone, the callers instruct any audience through do-si-do?s and strip the willows, until all are involved! Although with many line up changes and permutations, the band maintains a string band line up, featuring Fiddle, Banjo, Guitar, Double Bass and Mandolin. We have a variety of different dance callers for different events ? from the more traditional to the outright party starting. At bigger events we bring our posse of dancers and flat footers to whip up a storm on stage and in the crowd. If you want to party all night and wake up with straw in your hair the next day, then hit the Enquire Now button at the top of this page for a free quote. Alternatively add us to your shortlist and we'll get right back to you. Sorry, Cut A Shine doesn't have any videos right now Send us an enquiry and we'll get back to you, or check out the rest of the act profile. Sorry, Cut A Shine doesn't have any photos right now Send us an enquiry and we'll get back to you, or check out the rest of the act profile. Sorry, we don't have a setlist for Cut A Shine yet Send us an enquiry and we'll get back to you, or check out the rest of the act profile. Booking for our special wedding day, involving a number of talented musicians and musical enthusiasts as guests! Expectations were very high.The band fully delivered to these expectations in every way. Helping massively with our very specific and perhaps unusual requests! Hire a band were professional, thorough and a pleasure to work with. I cannot think of a single thing they need to change to their service!! !